Porous Plastic Polyethylene Filter tips - POLYPOR™ are especially suited for working with PCR techniques, and fully meet the requirements for microbiology and radioisotope work. The integrated hydrophobic polyethylene filter serves as a barrier against aerosols formed during pipetting. - Available in Sterile & Non - Sterile. - Yellow tips are cadmium free as per USA FDA guidelines. Gilson Pipetman Diamond Tips DT Sterile-Pack D200ST Individually Packed. 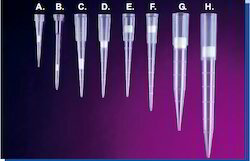 We are highly acknowledged organization engaged in presenting remarkable range of Pipette Tips.